When I popped into the supermarket last thing at night last week, I found a stew pack reduced to 10 pence and two courgettes reduced to 6 pence. 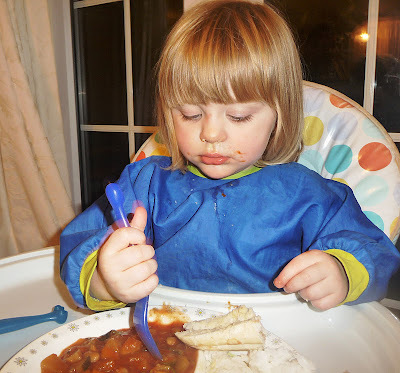 So after being inspired to use my slow cooker more by Claire over at Being a Mummy, and never one to resist a budget meal, I decided to turn my food bargains into a delicious Vegetable Stew for Meat Free Monday. Stew makes a healthy, tasty meal, especially as the cold nights set in. It is also an ideal way to use up any left over vegetables. You can make a stew go even further by adding any kind of lentils or beans. 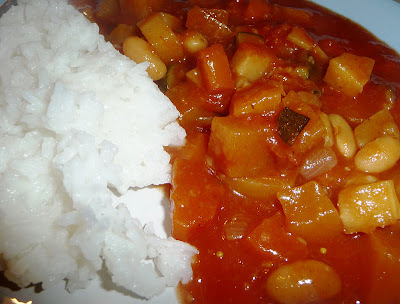 Additionally, this vegetable stew can be frozen as a whole dish, or individually portioned to defrost for a quick dinner if others in the family have eaten. I think that stew makes a great Meat Free Monday dish as it can be prepared beforehand at the weekend, or left to cook throughout the day. So by planning ahead you don't have to worry about rushing home to prepare dinner. Here is a basic method for cooking stew if you have not cooked one before. In a large pan, brown the meat or vegetarian meat substitute (if using) in some oil over a high heat and remove to a plate once browned. Over a medium heat, add some oil and fry the onion until softened and browned, if adding garlic or spices, add them now and stir for around a minute. 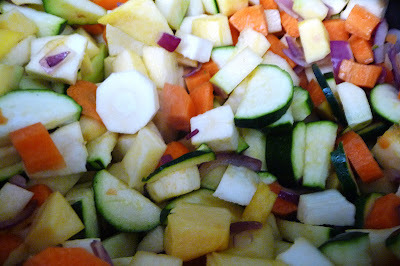 Add the chopped vegetables and any meat or substitutes back into the pan. 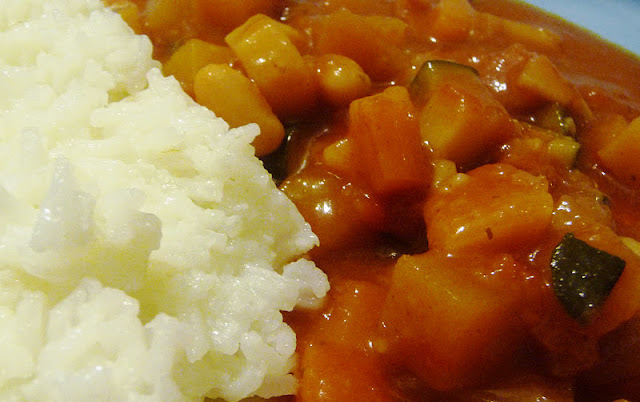 You could also add flour to thicken the stew if required. Next, add the liquid and herbs. Stir well and bring to a simmer on a medium to high heat. Once the contents are simmering, turn the heat down to low. Either transfer to the slow cooker, or cover with a pan lid and leave to cook until the meat and vegetables are tender. Check and stir regularly during cooking. You can add flour to thicken the mixture or water if the mixture if too thick, to even out the mixture. As a guide, the liquid should just cover the contents. 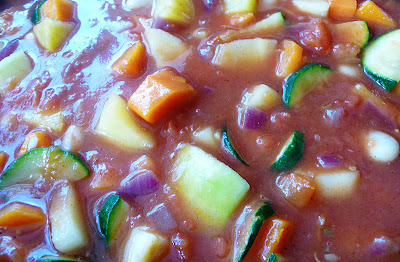 For my Vegetable Stew, I swapped the white onion in the stew pack for a red to add extra colour and flavour. I also coated the vegetables in honey before transferring them to the slow cooker to give them a slightly sweeter flavour. Add 2bsp of Honey to the vegetables and stir to distribute the honey evenly between the vegetables, Cook for 3 to 4 more minutes and then transfer the contents of the pan to the slow cooker. Now add the cannellini beans, tinned tomatoes, mustard seeds, chilli powder, paprika and flour to the slow cooker . Pour the vegetable stock in slowly, a bit at a time and stir. Keep on adding until the vegetables are just covered with the liquid. Cook on low for 6 to 8 hours, or high for 3 to 4 hours until the vegetables are tender and the ingredients have combined.